Located behind the Sacred Heart Cathedral, Hamilton, the Sacred Heart Columbarium is set in a landscaped, tranquil garden atmosphere, and provides an attractive location for grieving, prayer, reflection and meditation. A columbarium is an arrangement of openings, in a mausoleum or a wall, into which an urn or other worthy vessel containing earthly remains is placed as an enduring memorial to a loved one. The openings are covered with an inscribed plaque that acts as a memorial for the deceased and an attractive, practical alternative to burial in a cemetery. For more information contact the Parish Office and speak with the Parish Business Manager. Who can be placed in the Columbarium? 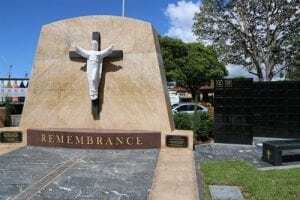 The Sacred Heart Columbarium is intended primarily for parishioners of any parish within the Diocese of Maitland-Newcastle, but not exclusively so. Approval can be granted by the Columbarium Committee to admit close family members or people of significance to the Diocese. I am Catholic, but my spouse is not - can we both placed in the Columbarium? Yes, close family members are permitted to be placed within the Sacred Heart Columbarium - this includes spouse, parents, grandparents, siblings, children and grandchildren of the purchaser. However, all funeral services and rites will be in accord with the Roman Catholic practices. How many may be interred in one niche? Only one person may be placed in a Columbarium niche. Each family member must be placed in a separately purchased niche. How do I make my final resting place wishes known to my loved ones? At the time of purchase, you will be issued with a holder's certificate. We recommend this certificate be stored with your will or similar documents so that it can be presented to the Columbarium Committee at the appropriate time. Are there any limitations on the wording on plaques? In order to maintain uniformity, consistency and order there is a standard and recommended way to inscribe the plaques. This is to avoid offending visitors to the Columbarium and maintain a suitable standard of decorum and reverence. Can I decorate around my niche any way I choose? The Columbarium site is designed to be maintained in a beautiful, serene, holy and edifying manner. Additional floral tributes, flags, statues, or other decorations may not be placed on or near a niche, or any other location in the gardens, without the written approval of the Columbarium Committee. Unauthorised material will be removed.